The Chicago Fire have jumped back into action, and their MLS schedule starts to get hot in mid-April. The Fire were the honored guest in the first home match played by the new Montreal Impact, and played to a 1-1 tie to begin the 2012 MLS schedule for Chicago. Toyota Park opened for business with a 1-0 victory over Philadelphia on March 24. Dominic Oduro has led the Fire to begin the season, scoring twice in the team’s first three matches. After a two-week break, the Fire’s regular season schedule gets rolling on April 15 when Houston visits. The Fire have a wonderful fan experience at Toyota Park that’s unique to the professional sports scene in Chicago. Led by an active group of fans known as Section 8, the crowds at Fire matches are entertaining and engaged. For more information about Section 8, click here. Among the upcoming experiences planned for Toyota Park will be a “Going Green” event when Chicago hosts Seattle on April 28. Fans will be able to bid on commemorative Fire jerseys from each member of the team. The winning bidders will have the opportunity to get the commemorative jersey signed by the player after the game as well. Funds raised will benefit the Chicago Fire Foundation. On July 21, the Fire will host Premier League powerhouse Aston Villa in an international friendly at Toyota Park. 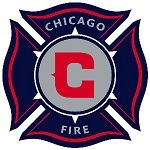 For a full Chicago Fire season schedule, click here. Tickets to Fire matches at Toyota Park run between $15-70. To buy individual game tickets for future Chicago Fire matches, click here. This entry was posted in Sports and tagged Chicago Fire, futbol, MLS, soccer, Toyota Park. Bookmark the permalink.